FIXER UPPER FLOORING TRENDS WE LOVE | Outer Banks Floor Covering Inc.
Have you been watching season 5 of Fixer Upper? We have and we are particularly smitten with the fun flooring trends we’re seeing this year! Today, we’re rounding up three of our favorite trends so far. Tell us your favorite in the comments below! The Holmes home was built as a bachelor pad, so low maintenance design elements were key. Joanna choose tile floors that look like wood because they are easy to maintain while making the statement of hardwood flooring. Tile flooring – or LVP, if you have a more moderate budget, – is an excellent choice if you want to achieve the same look as wood but have pets, small kids, or a high traffic. 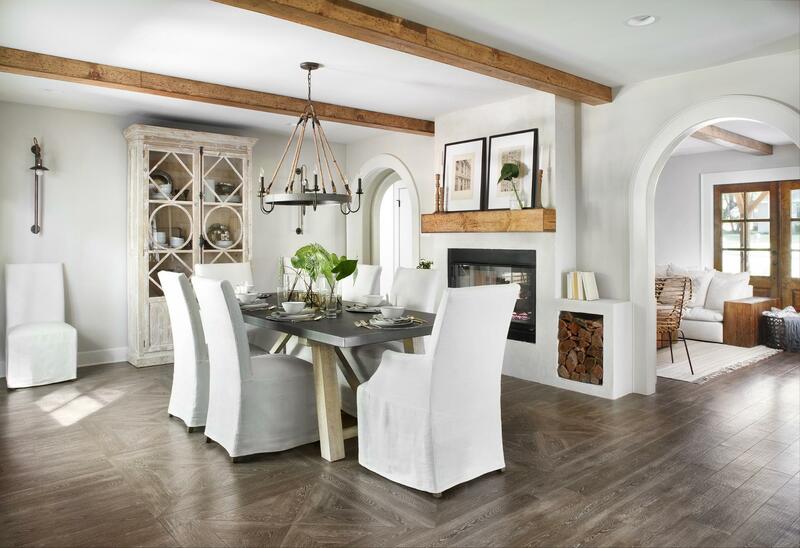 We’ve seen a lot of parquet-style flooring inlays this season and this one from the Ivy House is one of our favorites! Subtle and classic, this rug-shaped inlay is a unique way to draw a contrast between two rooms, while also keeping them unified. Not only is it unexpected but it also removes the need for a rug! We love the striped tile pattern Chip and Joanna created in the Copp home! The pattern carried from the floor up the back wall made a fun and timeless statement that really stands out. The stripes also make the room feel more spacious. Contact us, to incorporate one or more of these elements into your home! Pictures and designs from Magnolia Homes.